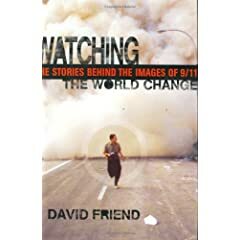 I’m about halfway through David Friend’s new book about the photography of 9/11 called “Watching the World Change“. It’s a comprehensive piece of work that covers every kind of conceivable photographic viewpoint of what happened on the streets of New York that day; amateur hobbyists photographing on their way to work, the world’s best photojournalists rushing to the scene, and people ducking into drugstores to buy disposable point-and-shoots (the results of one such purchase made the book’s cover). The book charts a divide in photography. 2001 was the brink of digital, and while most of the published photos from that day were on film, the event itself contributed to digital’s swift takeover of photojournalism. When coupled with these videos (on The Digital Journalist) of photojournalists recounting their efforts, and this piece at Magnum In Motion, the picture of what happened that day has a new fullness, which for me, has been worthwhile. The book has its own site/blog here. The book’s well footnoted, with a generous index, but I wish that a book about photographs had the rights to publish all of the work it describes. Some photos are included, most are not. Google searches for some of the photographers mentioned yield zip. Too bad the website doesn’t step-up to fill-in that gap. Update: One of the most surreal passages in the book is on page 158. Senks, its very interesting !! !